Owen was born at Glynucha, Langelynin, Caernarvonshire, Wales in the June quarter 1885. 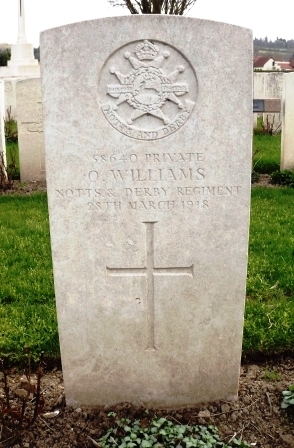 He was the son of William (Farmer) and Grace Elizabeth Williams. He had an older brother, William John, and a younger brother and a younger sister, Robert Llewylyn and Anne Mary. (1891 Census RG 12/4671). On the 24th December 1908 Owen married Lois Noton, at St James' Church, Buxton, and the following year their daughter, Edith, was born. Another daughter, Grace E., was born in February 1911, by which time the family had moved to Mainfields, Bakewell, Derbyshire, and Owen was employed as a "Domestic Gardner". The family must have returned to live in Buxton by the end of 1913, when son, Owen E., was born. After Owen's death the CWGC records the family address as 3 West View, Queens Road, Fairfield, Buxton. Owen enlisted at Buxton. His Service Papers have not survived the ravages of Second World War bombing, nor does his Medal Index Card give any indication of when he entered the War, although, as he did not qualify for the 1915 Star Medal, it must have been after 1915. The Battalion was originally formed on 1st October 1914 at Derby. It formed as part of K3 (Kitchener's Second New Army) and attached as Army Troops to 24th Division as a Pioneer unit, then moved to Shoreham. In April 1915 it converted into Pioneer Battalion for same Division and on 29th August 1915 landed in France. The 'famous' Wipers Times was also a 12th Battalion publication. The Wipers Times was a trench magazine that was published by soldiers fighting on the front lines of the First World War. In early 1916, the 12th Battalion was stationed in the front line at Ypres, Belgium and came across a printing press abandoned by a Belgian who had, in the words of the editor, "stood not on the order of his going, but gone." A sergeant who had been a printer in peacetime salvaged it and printed a sample page. The paper itself was named after Tommy slang for Ypres itself. During the Battle of the Somme in 1916 the 24th Division took part in the Battle of Delville Wood and the Battle of Guillemont. In 1917 they were engaged in the Battles of Vimy Ridge, a phase of the Arras offensive; the Battle of Messines, the Battle of Pilckem Ridge and the Battle of Langemarck. Prior to that Battle, earlier in 1917, the 39th Division had fought in the Battles at Pilkem Ridge, Langemarck, Menin Road Ridge and Polygon Wood. Just a week before Owen died of wounds received in action 'Kaiserschlacht' - the first day of the German Spring Offensive - had begun on 21st March 1918, beginning with the three day Battle of St Quentin (21st - 23rd March 1918), followed by The First Battle of Bapaume, (24th - 25th March) and The Battle of Rosières (26th - 27th March). Owen died of wounds on the 28th March 1918 which more than likely he received between the 21st and 26th March when the Battalion was pushed back through Marchelpot, Lihons, Chaulnes and Meharicourt. The Battalion History states that on the 28th itself they were ordered to withdraw to Cayeux, but in the vicinity of the Bois-de-Pienet came under heavy shellfire. The Battalion formed a defensive flank on the Marcelcave-Wiencourt line and repulsed a heavy German attack - the enemy suffering heavy losses. Later in the day they again moved back to near Aubercourt, with German shelling all the way. CWGC Records show that the 12th Battalion lost 43 Officers and men between the 21st and 28th March, mostly on the 27th. 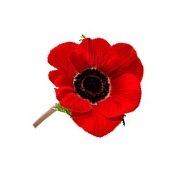 Only six have a known burial place, the remainder are commemorated on the Pozières Memorial. Five men, including Owen were killed or died of their wounds on the 28th. He is buried at Namps-Au-Val Cemetery and at the end of March 1918, when the German offensive in Picardy began, the 41st, 50th and 55th Casualty Clearing Stations arrived in Namps-au-Val, remaining until the middle of April. Almost all the burials in the cemetery were carried out by one of these three CCS. near to Owen in Grave I.E.11. · I am grateful to Martin McNeela for extracts from the official history.